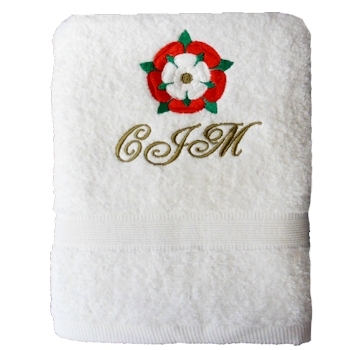 Embroidered Tudor rose motif towel with personalised name for a special gift. The Tudor Rose is the heraldic English emblem of the Tudors and represented the fusion of the Lancastrian and Yorkist noble factions. This fusion was symbolised by the white rose of York and the red rose of Lancaster. The Tudor Rose is the heraldic English emblem of the Tudors and represented the fusion of the Lancastrian and Yorkist noble factions. This fusion was symbolised by the white rose of York and the red rose of Lancaster. An important emblem of the Tudors dynasty which marked the end of the devastating English civil war called the Wars of the Roses. Custom embroidered with the Tudor Rose motif and your choice of personalised name or initials. Please select the thread colour and letter font style you prefer for the name.